Valentina was born in Boynton Beach, FL. During her childhood, she lived in Venezuela and then returned to Florida in 1998. She attended the University of Central Florida and graduated with a Bachelors degree in Business Administration and Finance. She has always enjoyed looking for unique properties. She made her first Real Estate investment at the age of 21 and has loved it ever since. She enjoys working, traveling and spending time with family and friends. 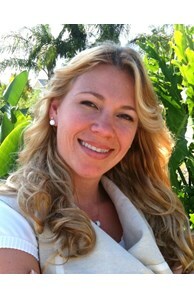 She currently lives with her son Jason and her lovable golden retriever Molly in Windermere, FL. If you are looking for someone who listens to your needs, works diligently, provides attention to details and understands the importance of superior customer service, call Valentina. She is a trained real estate professional with expert skills at marketing, presentation, negotiation and sales. Valentina will work with you to ensure that your property is sold for the highest and best price possible in the shortest amount of time with the least amount of inconvenience to you. Valentina enjoys helping people find unique properties. Living in Windermere among the lakes, provides her with an edge advantage to find and/or market Luxury Estates, Golf Communities and Lakefront Properties. Areas of expertise include: Windermere, Lake Buena Vista, Dr. Phillips, Winter Garden and Gotha. The Internet has facilitated the Real Estate Market tremendously. Through the Web we now have a window to a globalized marketplace. My affiliation with Coldwell Banker provides You with the resources necessary to obtain unprecedented global exposure for your property at a value that cannot be matched. Your property will be listed in sources such as: Google.com; Trulia.com; NYTimes.com; FloridaMoves.com; Coldwellbanker.com and Realtor.com just to name a few. Also, most of the sites now provide mobile web access and mobile web apps which, increases even more the exposure of your property. Whether you want to Buy or Sell Real Estate, let Valentina provide you the expertise and professionalism you deserve. As a real estate professional, Valentina knows the true value of our community. She proudly support our local charitable organizations through her participation in Coldwell Banker Residential Real Estate CARES. Since 2001, Coldwell Banker Residential Real Estate CARES has donated over $1.5 million to a wide array of non-profit educational, health, welfare, environmental and cultural arts organizations. In Addition, we’ve sponsored 12 Habitat for Humanity homes statewide, with several more in progress. Other Charitable organizations that Valentina likes includes: UNICEF, The Bill and Melinda Foundation, Make it Right Foundation, Pet Rescue by Judy and the Google.org Foundation.